Ambassador 2014 - The JL Foundation, Inc. 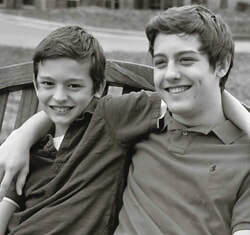 The TJ-JL Foundation for Diabetes is honored to announce their Youth Ambassadors for 2014, brothers Simon and Oliver Black. Simon Black is a 15 year old freshman at Gonzaga College High School. Oliver is 13 and in the 8th grade at Norwood School. Simon likes playing football and cycling, and Oliver loves hockey and dirt biking. They both enjoy traveling and hanging out with their friends. Simon was diagnosed with Type 1 Diabetes when he was 9 years old and Oliver was diagnosed this past July. Over the last six years, they both have volunteered to help others with diabetes through JDRF and Children’s National Medical Center. They look forward to joining with the TJ-JL Foundation to continue their work to find a cure. ​Type 1 Diabetes is an auto-immune disease that effects 1 in every 500 and is increasing every year. It usually strikes in childhood (it was formerly known as “Juvenile Diabetes”), but is on the rise for adults as well. There is currently no cure for this disease, nor is there a known cause. The Bethesda-based TJ-JL Foundation was founded in 2004 and has raised over $250,000 through golf-tournaments and other events.